Powered by 2 & 4 pole; capacitor start induction run, split phase, permanent split capacitor, polyphase (2 pole only), shaded pole, reluctance type synchronous motors. Available with automatic inherent thermal winding protection. 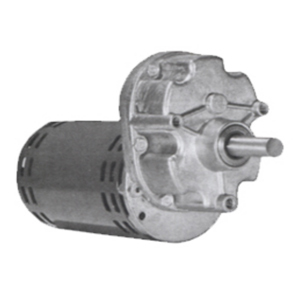 Motor Frame: Diameter - 3"
Designed for maximum efficiency, high starting torque and long life. Helical first gear for low sound level application. Oil sealed gear reducer for extended life. Precision cut hardened steel wide face gears. 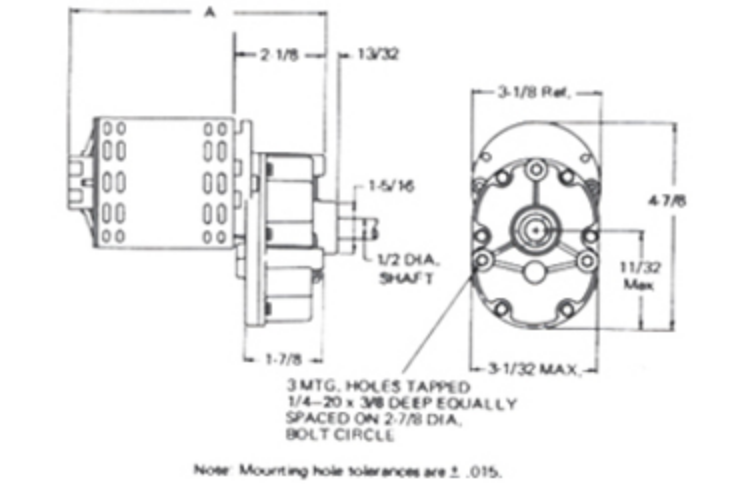 Sleeve or needle bearings in output shaft for overhung loads. Hardened heavy duty steel gear pins and rugged zinc diecast gear case. Output speed range 3 to 850 RPM. Output shaft length per application. This heavy duty gear reducer construction incorporates a two gear shaft design for max. life under high torque, heavy stress, and max. shock loads.